September 26, 2017 September 26, 2017 by Nils Oudhuis . Tags " H-reflex " . The Brazilian Patellofemoral Pain Research Group, coordinated by Prof. Fábio Mícolis de Azevedo, has been investigating innovatively the neurophysiological pathways of patients with patellofemoral pain through H-reflex. The H-reflex is a valuable tool to assess the excitability of spinal cord pathways. Two recent papers were published by our group, the first one1 reported that patients with PFP presented lower H-reflex excitability. The second one2, reported that lower H-reflex is associated with chronicity of the condition, lower physical function and higher level of pain. If spinal excitability is lower than normal, the strength to which the muscle responds to commands that arrive at the motoneurons might be impaired. Therefore, muscle strengthening exercises for PPF management might not be effective in a long-term basis because the exercise-induced improvements may promptly be lost due to inhibition at the spinal level. In this direction, the Brazilian Patellofemoral Pain Research Group planned a prospective study to investigate if the lower H-reflex is a risk factor or a consequence due to long-term pain of these patients. Marcella Pazzinatto is a PhD student who is leading this study with a great team, composed by Prof. Fábio Mícolis de Azevedo (Sao Paulo State University), Prof. Fernando Magalhães (University of Sao Paulo) and Prof. Evangelos Pappas (University of Sydney) and myself. We recently published the hypotheses of this project3 in the Medical Hypotheses Journal. So, we have strong clinical implications for the two hypotheses raised by this study. 1 – If lower H-reflex is a risk factor for patellofemoral pain, it might be identified and targeted interventions may be planed before patellofemoral pain symptoms begin. 2 – If lower H-reflex is a consequence due to chronic pain, it also requests targeted intervention as the long-term prognosis of patellofemoral pain is poor4. Perhaps, it is happening because spinal inhibition is installed but has received no attention! There are a variety of ways that may potentially increase H-reflex excitability (e.g. proprioceptive exercises, neuromuscular stimulation, reflex operant conditioning, etc). They could be included alongside the best available evidence for patellofemoral treatment5. 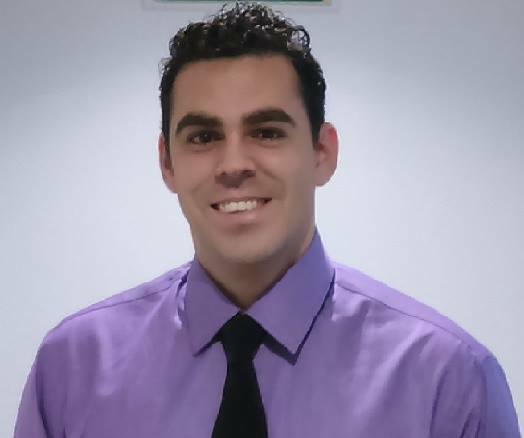 Danilo De Oliveira Silva is a Physioterapist with a passion by translating research into clinical practice with a focus on knee pain. He concluded his undergraduation (2012) at the State University of West Parana, Brazil. Mater Science degree in Physiotherapy (2015) at the Sao Paulo State University, Brazil. He is doing a PhD in Physiotherapy at the Sao Paulo State University (ongoing). Currently, he is an honorary visiting PhD student (ongoing) at La Trobe University, Australia. Danilo can be reached via email at daniloolive.silva@gmail.com, twitter and facebook. He is the manager of the Brazilian Patellofemoral Pain Group page on Facebook, a nice place up to date your knee pain knowledge! De Oliveira Silva D, Magalhães FH, Faria NCS, et al. Lower amplitude of H-reflex in females with patellofemoral pain: Thinking beyond proximal, local and distal factors. Arch Phys Med Rehabil. 2016;97(7):1115-1120. doi:10.1016/j.apmr.2015.12.017. De Oliveira Silva D, Magalhães FH, Faria NC, et al. Vastus medialis Hoffmann reflex excitability is associated with pain level , self-reported function , and chronicity in women with patellofemoral pain. Arch Phys Med Rehabil. 2017;98:114-119. doi:10.1016/j.apmr.2016.06.011. Pazzinatto MF, de Oliveira Silva D, Pappas E, Magalhães FH, de Azevedo FM. 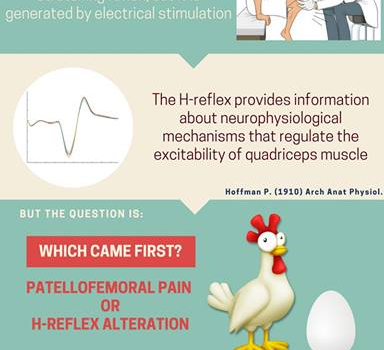 Is quadriceps H-reflex excitability a risk factor for patellofemoral pain? Med Hypotheses. 2017;108:124-127. doi:10.1016/j.mehy.2017.08.019. Lankhorst NE, van Middelkoop M, Crossley KM, et al. Factors that predict a poor outcome 5–8 years after the diagnosis of patellofemoral pain: a multicentre observational analysis. Br J Sports Med. 2016;50(14):881-886. doi:10.1136/bjsports-2015-094664. Crossley KM, van Middelkoop M, Callaghan MJ, Collins NJ, Rathleff MS, Barton CJ. 2016 Patellofemoral pain consensus statement from the 4th International Patellofemoral Pain Research Retreat, Manchester. Part 2: recommended physical interventions (exercise, taping, bracing, foot orthoses and combined interventions). Br J Sports Med. 2016;50(14):844-852. doi:10.1136/bjsports-2016-096268.